NEW YORK — Americans looked back on the September 11th attacks Tuesday with solemn ceremonies, volunteer service and a presidential tribute to “the moment when America fought back” on one of the hijacked planes used as weapons in the deadliest terror attack on U.S. soil. Thousands of 9/11 victims’ relatives, survivors, rescuers and others gathered on a misty Tuesday morning at the memorial plaza where the World Trade Center’s twin towers once stood. 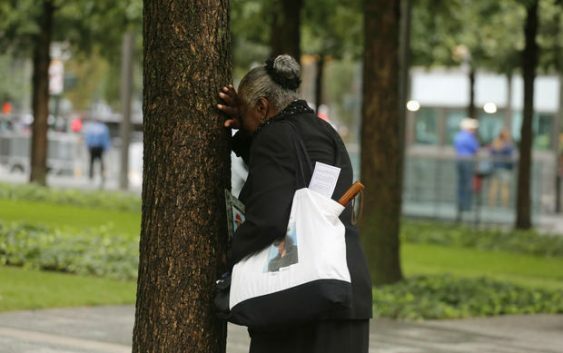 A woman weeps by herself as she leans against a tree during a ceremony marking the 17th anniversary of the terrorist attacks on the United States. Tuesday, Sept. 11, 2018, at the World Trade Center in New York. Watch video: On the morning of September 11, 2001, CBS News photojournalist Mark LaGanga’s cell phone and home landline rang simultaneously. An editor on the CBS News national desk was calling and directed LaGanga to drive to downtown Manhattan to shoot what, at that time, was thought to be a small plane crash at the World Trade Center. Only 29 minutes passed between the two World Trade Center towers falling. Photojournalist Mark LaGanga captured the eerie scene up close in this 60 Minutes segment. Dedicated on Sunday, the new Flight 93 National Memorial in Shanksville, Pennsylvania honors the heroes of Flight 93 who thwarted the hijackers’ plans on 9/11. Standing in a field amid the rolling hills of central Pennsylvania, the “Tower of Voices” stands 93 feet tall. The tower is a work in progress. It currently holds eight wind chimes. But will soon be expanded to 40 – one for each passenger and crew member who died here on September 11, 2001. Only two days ago, the Cortlandt Street subway station, which was located directly below the World Trade Center, was re-opened for the first time. When the towers came down, parts of the buildings tore through the terminal. The devastation left a gaping hole above the station, and twisted the massive metal beams of the roof. After nearly two decades, the newly rebuilt and renamed WTC Cortlandt station opened just days before the 17th anniversary of the attacks. Work only began on the project in 2015 because New York’s Metropolitan Transportation Authority (MTA) was not able to gain control of the site until then.